PIGEON FORGE – On June 20th, 1782, our nation’s Founding Fathers placed the Bald Eagle at the center of the Great Seal of the United States. Since then, the Bald Eagle has served as the pride of America’s skies and the living symbol of all that America stands for: Freedom, Courage, Strength, Spirit, Independence, Democracy, and Excellence. Since 1995, the not-for-profit American Eagle Foundation (AEF) (www.eagles.org) has spearheaded the establishment of American Eagle Day. To date, over 80 governors from 49 states have recognized “American Eagle Day” with Proclamations and special documents, giving the USA’s National Bird its own “official day” in their states. 2017 marks the 10th year of American Eagle Day being recognized by U.S. Congress. The USFWS estimates that there are more than 143,000 Bald Eagles in the United States today (including Alaska). 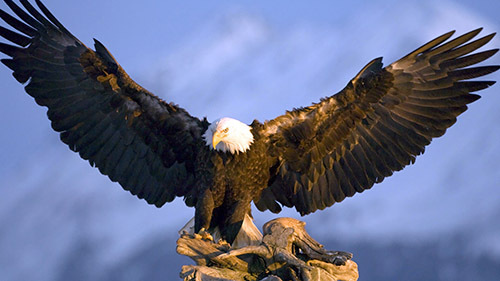 The Bald Eagle was removed from Endangered Species Act protection in 2007, but still remains protected by the Bald & Golden Eagle Protection Act of 1940. “On American Eagle Day, and every day, let us continue to treasure and protect the Bald Eagle all across this great land for future generations to enjoy,” says Cecere, who has dedicated his life to Bald Eagle conservation for over 30 years. The American Eagle Foundation is a not-for-profit 501(c)(3) organization whose mission is to care for, restore and protect the USA’ s living symbol of freedom, the Bald Eagle, and other birds of prey through the four pillars of Education, Repopulation , Conservation, & Rehabilitation. It is headquartered in the foothills of the Great Smoky Mountains at Dollywood theme park in Pigeon Forge, TN. Learn more at www.eagles.org. Glory Fledges Nest in Time for American Eagle Day! Chatter Reunion & American Eagle Day at Dollywood a Huge Success!